On September 11th, the day before the Global Climate Action Summit conference brought world leaders together to strategize around climate change, Department of Public Works Director Mohammed Nuru sent an email to his entire staff to prepare them for a long weekend of hard work. But behind the hopeful and rosy tone of Nuru’s message was a targeted attack on poor and homeless communities in the neighborhood surrounding the Moscone Center all in the name of the Global Climate Action Summit. On the schedule for the summit were Governor Brown (who rubbed elbows with politicians from all over the world), actors like Robert Redford and Alec Baldwin, and corporate heads like Marc Benioff of Salesforce, Brian Deese of Blackrock, and Kevin Johnson of Starbucks. But the summit itself was punctuated by large protests led by environmental justice advocates who criticized the summit for excluding community leaders who have been at the forefront of climate work. But in addition to the exclusion of key climate action leaders, the conference became the justification for encampment sweeps and criminalization. Documents released by the Department of Public Works (DPW) demonstrate a coordinated effort involving San Francisco Police Department (SFPD) and the Department of Homelessness and Supportive Housing (HSH) to remove all homeless people from the area around Moscone Center for the length of the conference. 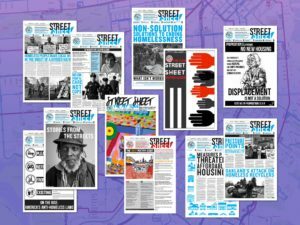 This coordination is known as the Healthy Streets Operations Center (HSOC) or more simply as the command center, which has ramped up the attack on homeless people in San Francisco over the last six months. They were in full force to keep homeless people from the area during the GCAS. Meeting notes released by DPW show that the agency was preparing for the GCAS by conducting what they called a “city shining”, taking special note that there would be “prime ministers, governors, and mayors in attendance” and encouraging staff to “be on their best behavior”. The notes also read “HSOC is expanding personnel to keep things good in the downtown area from Van Ness to Embarcadero with special attention to Civic Center, Moscone, and the downtown hotels and BART stations”. The notes also indicate that SFPD Commander Lazar had ordered a new procedure for HSOC in their efforts to clear the streets, reading “SFPD will be taking lead on all encampment requests. They will be first on scene to initiate enforcement.” Police should never be the first point of contact with homeless people, who are traumatized by the constant criminalization they endure in San Francisco. The released documents also reflect what homeless advocates have been saying for a long time about the city’s failure to comply with its own “bag and tag” policy, which requires that belongings confiscated during encampment destructions are labeled and stored in a facility from which residents can later claim them. But DPW’s own notes report that the “Bag and Tag cage is a mess” and asks workers “please don’t just dump items there”. This means that when people are displaced by sweeps they are unable to retrieve the belongings that are confiscated from them, including family heirlooms, medications, and survival gear. For its part, the Department of Homelessness and Supportive Housing (HSH) offered a plan in coordination with HSOC that left much to be desired. The main resource supposedly opened up to accommodate for the mass displacement of homeless people for the summit was to open up winter shelter capacity starting on Tuesday and ending on Saturday morning. What this means for those being displaced would be checking in to MSC or Next Door shelters late at night and being out early the next morning, with only a mat to sleep on in the kitchen. HOT Team resources were also to be concentrated around the conference from Tuesday to Saturday. HSH notes also reflect an effort to “coordinate efforts through HSOC” and “ensure that SFPD and other HSOC partners are aware of resources and locations where they can direct or transport homeless individuals”. After the summit, Mayor London Breed published an article on Medium in which she wrote “We are already seeing the impacts of climate change in our backyard, as evidenced by the increasingly devastating fires and droughts throughout California.” She listed out commitments that she was making to improve San Francisco’s environmental impact, promising to reduce landfill disposal and to increase renewable energy. She also promised that the new developments she has promised to build will run on renewable energy. But conspicuously absent from Breed’s commitments is any acknowledgement of homeless people, who stand to suffer the most from the devastating impacts of climate change on our city.